Apologies for the lack of Spring posts, my friends. I’m back in the saddle now. (On the palette?) 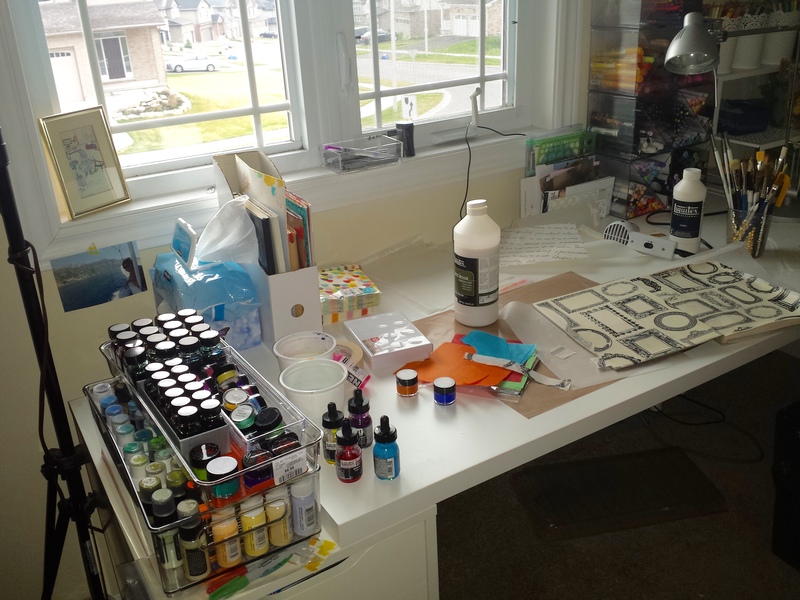 Here’s a pic from my new art studio (moved it twice this year already, not moving again) where I’m working on altering a book into an art journal for personal use. Not adding any watercolor paper, just removing and altering pages that already exist. In these pics I’m using tissue paper and napkins as background layers. There’s something about me you may not know: when I stumble onto something awesome it kind of takes over my brain. Maybe this is why if I find one great marker I have to have the whole set of colors? In every nib size? Hmmm. 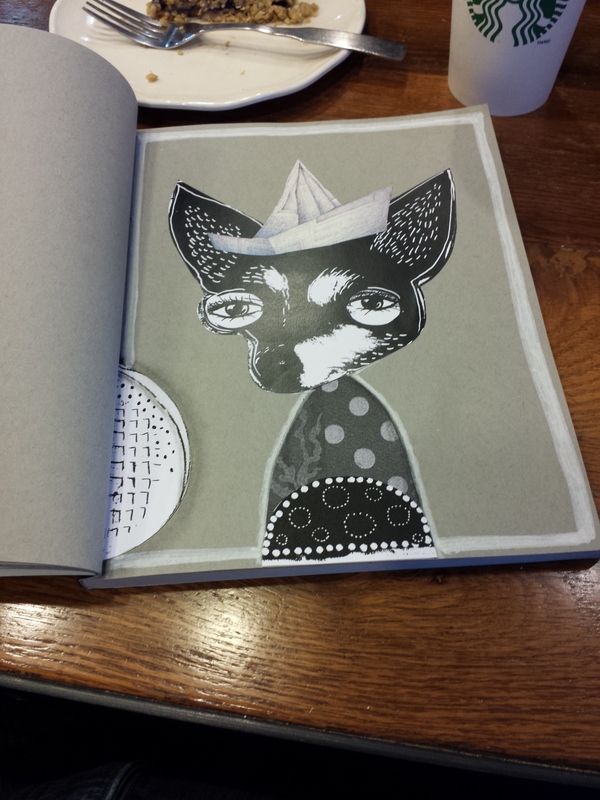 My latest obsession is handmade Altered Art Journals. Full disclosure: I’m making them and they’re for sale on Etsy. But that’s not why you should continue reading. Continue reading to find out why they’re so awesome! I’ve discovered that there’s something wonderful about journals with pages already full of text and illustrations. 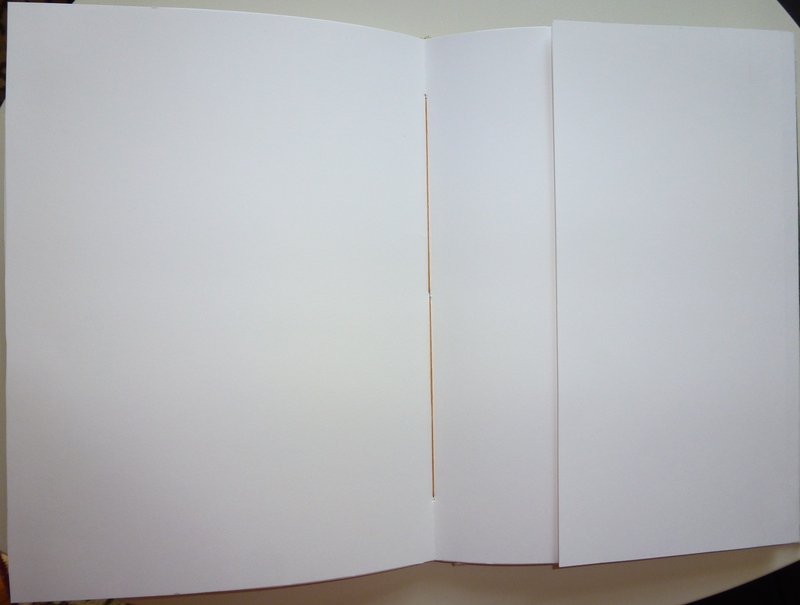 The lack of blank pages! But wait, you might be asking, aren’t journals supposed to have blank pages? Fair enough. I have dozens of journals: ones I’ve purchased, been gifted or made myself. They all have blank pages. The paper quality varies, though. 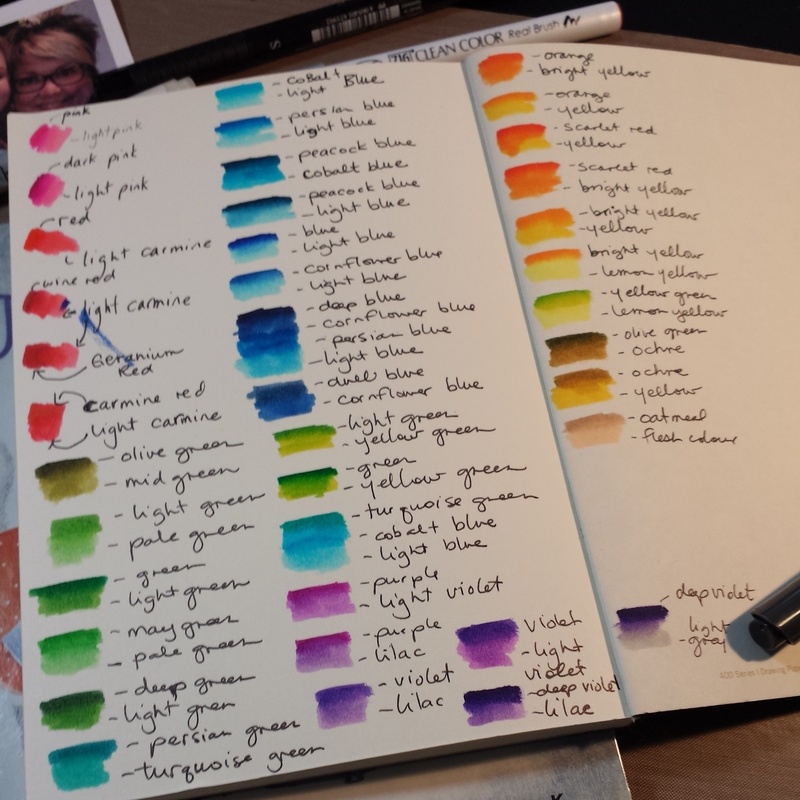 So depending on what you want to do in your journal, you may need several with varying paper types. That blank page is pretty darn powerful. Well guess what?! You can take back your power! 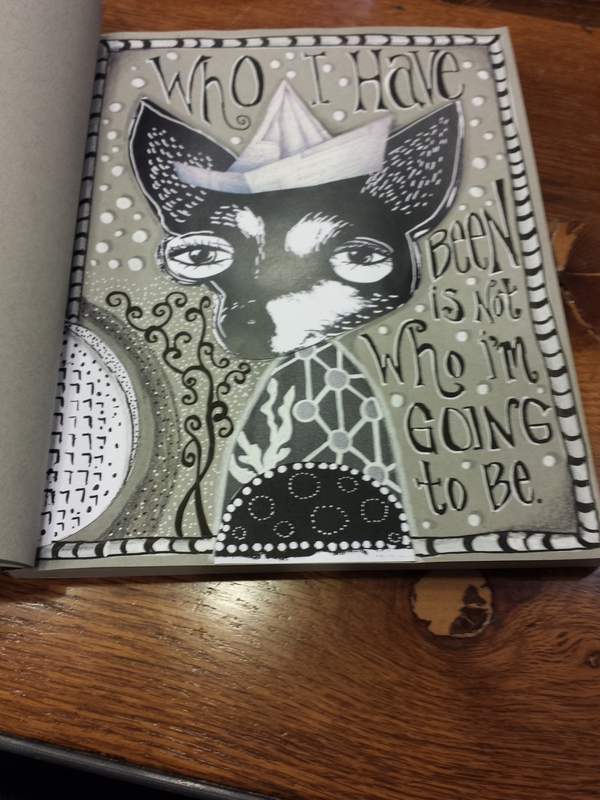 Altered Art Journals can help you do just that because its pages are already covered with text and images, making these ‘already been started,’ a place to begin. 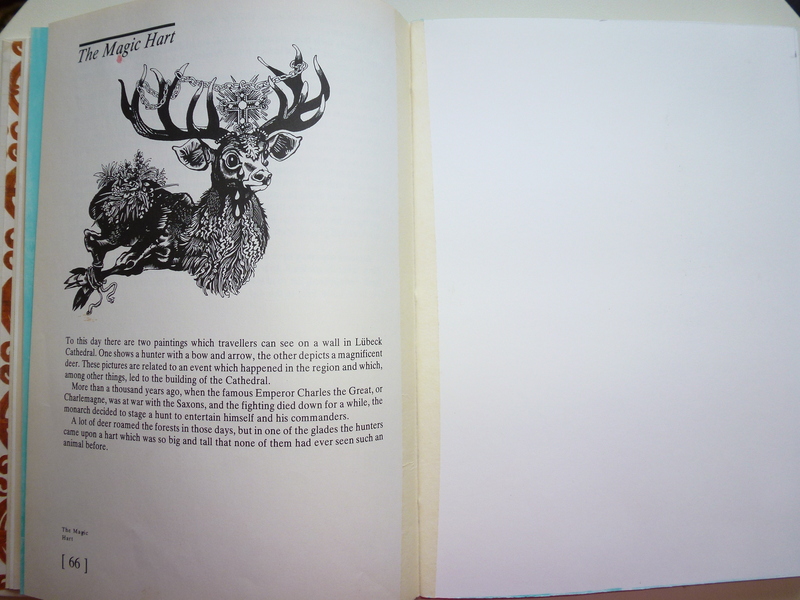 (If you want to dive right in, clean pages await for any medium you desire – more on that below.) There’s just so much already between the covers to work with making Altered Art Journals far less daunting that a journal filled with blank pages! And while artists of all levels can create in these, this can be especially freeing for the new or uncertain artist. 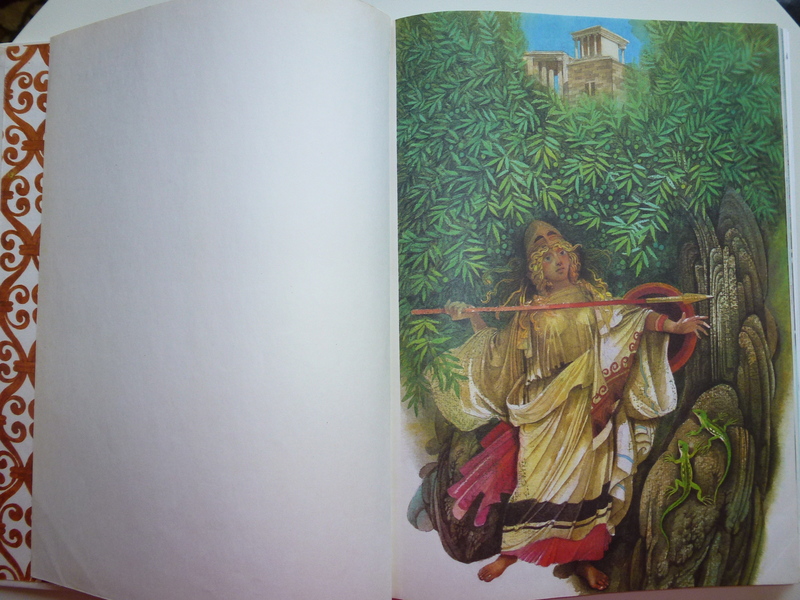 I spend a lot of time choosing just the right vintage hardcover book. An artist’s eye is needed to assess binding, construction, condition, paper weight and, of course, existing art. Generally, these books have some value due to their vintage nature. Plus, they’re cool. Auditioning which illustrations are worthy enough to be in your Altered Art Journal is an intuitive process and each book is treated as though I was recreating it for myself; I have to love it to ensure it’s good enough for you. 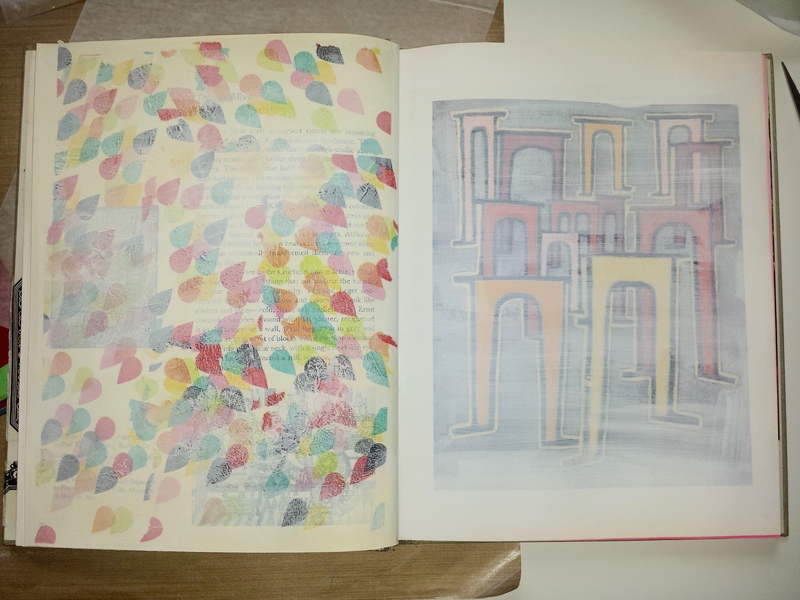 I gently remove between 50% – 70% of the book’s pages to make room for the professional quality, 140lb hot press watercolor paper I’ve cut to fit. Of the vintage pages that remain I do my utmost to keep as much of the beautiful, original art between the covers as I possibly can. After carefully separate the book from its binding, I nestle the new signatures (sets of paper) among the original pages and bind them securely with Irish linen. Next, I put the book back together in such a way that the spine remains intact, making it appear as though the book has always had watercolor paper inside. I also reinforce any areas where the hinge might be vulnerable using artist’s quality, archival paper tape (which can be painted over). 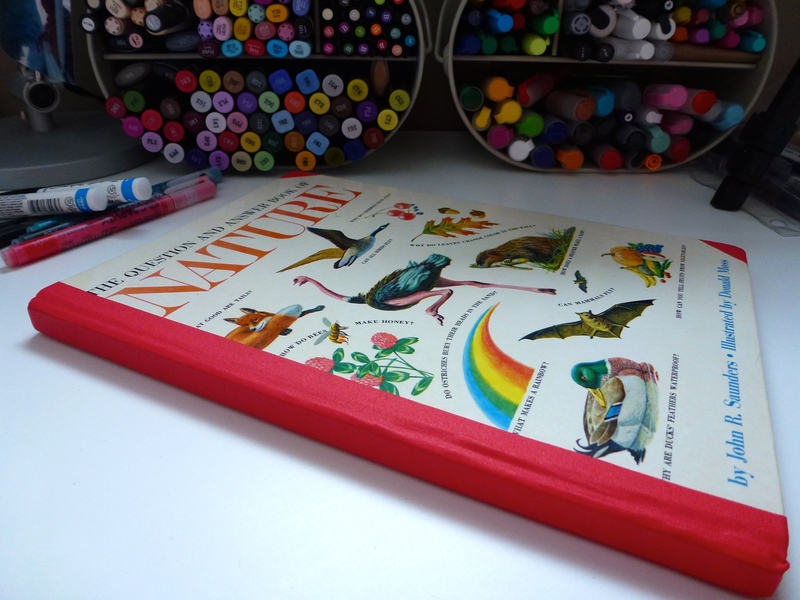 If a vintage book has been particularly loved, I go a step further and reinforce the spine and cover. After all, this book is meant to be used. 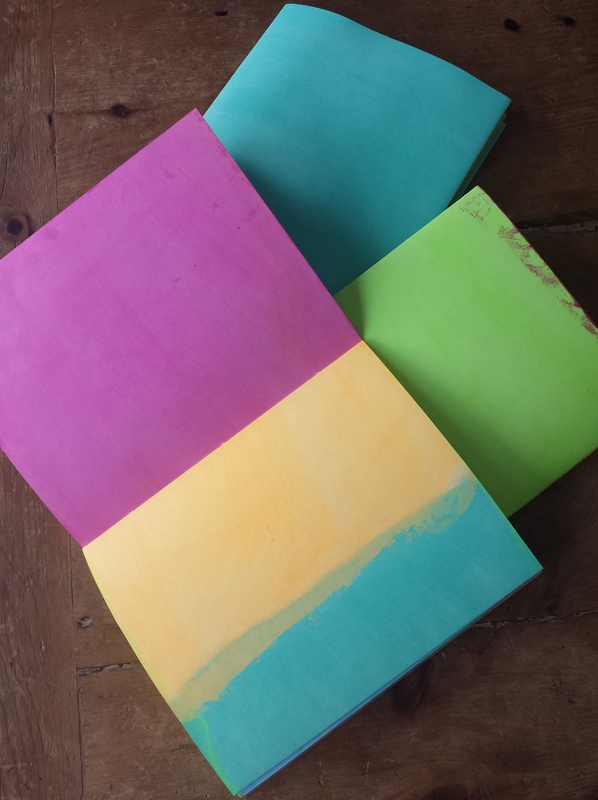 At this point the one-of-a-kind Altered Art Journal is ready for sale. The watercolor paper can handle your water-based media (acrylic paint and watercolors) while the original pages are perfect for collage, stamping, sketching, paint pens, coloring… there are no limits. 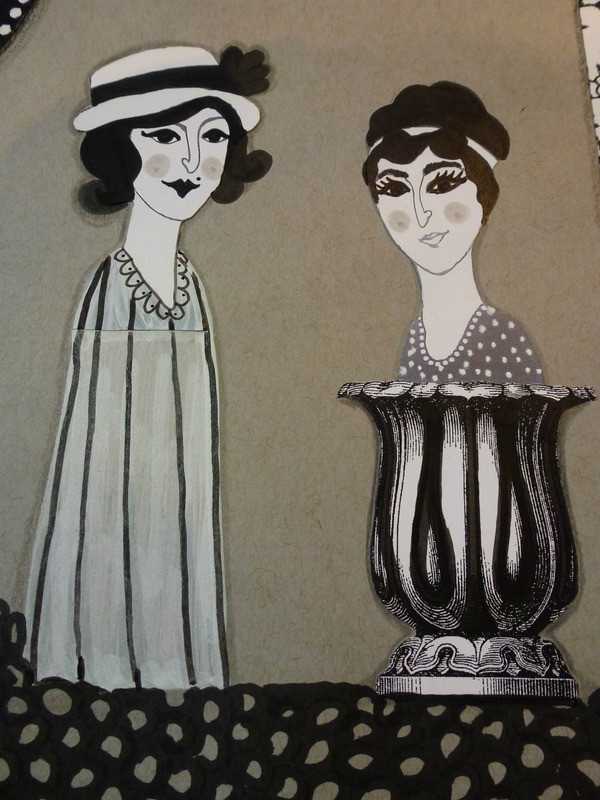 The original illustrations can be doodled on, painted over, collaged around… it’s yours to change in whatever way pleases you! 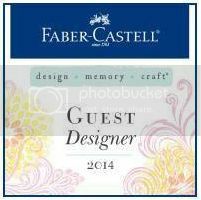 It is possible to customize the journal further. 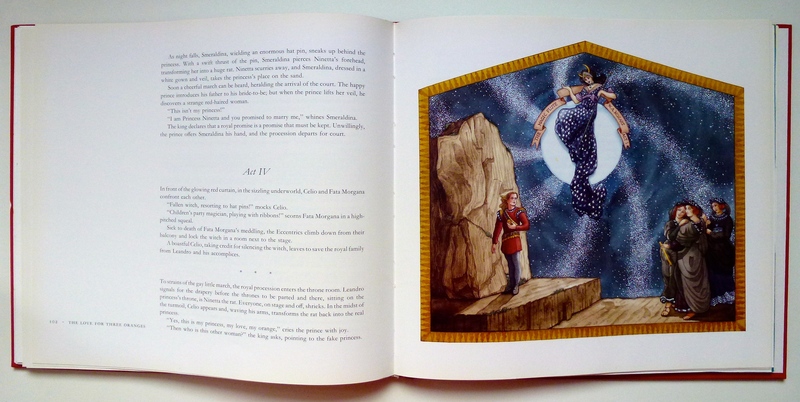 For example, prepping some of the original pages for wet media with gesso or other mediums, tinting some of the pages to match corresponding illustrations, taping the spine… It’s also possible to request a certain size of book for altering. (Just contact me through Etsy.) I’m currently working on a commission to prep all the pages of an Altered Art Journal. 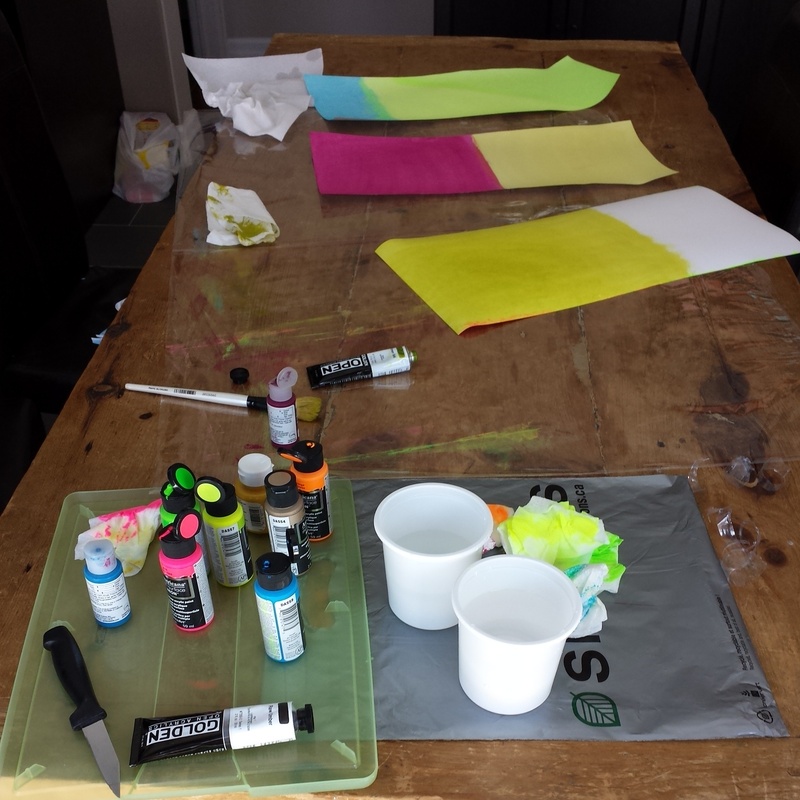 Art Journaling 101: An Exciting New Development on Facebook! One of the main lessons I’m learning on my creative journey is to respect, not fear, the subjectivity of art. I used to think that a painting was only ‘good’ if it looked like it did in real life. 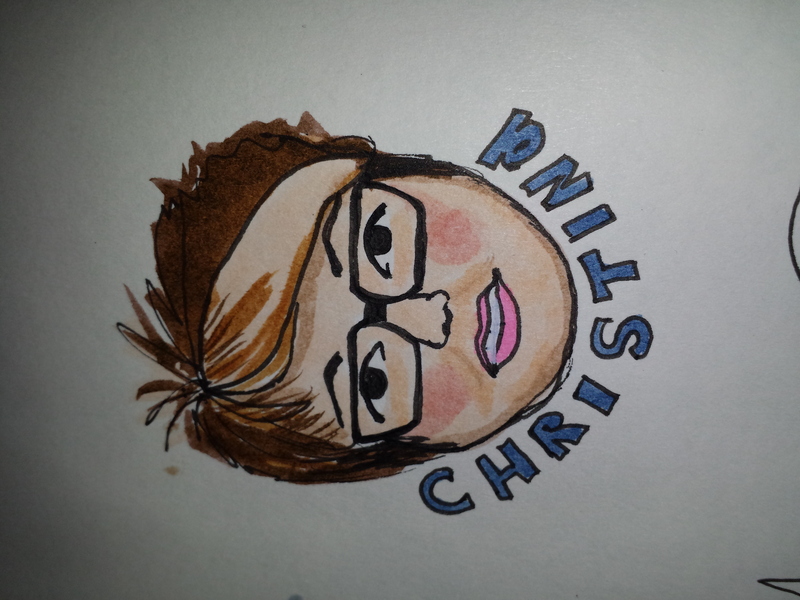 I think I assumed that the ability to technically reproduce an image by hand equalled talent. And maybe it does. But I also came to understand that while I can respect the talent that goes into photo realism, it’s not something my spirit enjoys. I have no connection on an emotional level when I look it. ie: boring! When I looked more closely at the artists I do enjoy I realized there were many things I could criticize, all of them technical. Yet I LOVE all of their art. It inspires me and makes me happy when I look at it. And I’ve come to learn that it is exactly the subjectivity that each artist brings to their work that makes it interesting to me. Think of Monet, Van Gogh… I mean, how boring would the world be if we didn’t have their beautiful styles? Only Jane Davenport could make faces the way she makes them. Only Juliette Crane can make owls like Juliette Crane. There is only ONE Teesha Moore. When I look at art I now look for what makes it different, what makes it uniquely that artist’s work. How does it appeal to ME? The kicker is, I’m challenging myself to view my own art in the same light, to teach myself to see that the things I don’t like about my own art is really more about the growth of my personal style and to start accepting them. If Jane Davenport stopped because the eyes she drew were too big, we wouldn’t have her beautiful mermaids. If Juliette Crane let her inner critic convince her that her owls were stupid, I wouldn’t be able to look at them and smile because I think they are sooooooo cute! 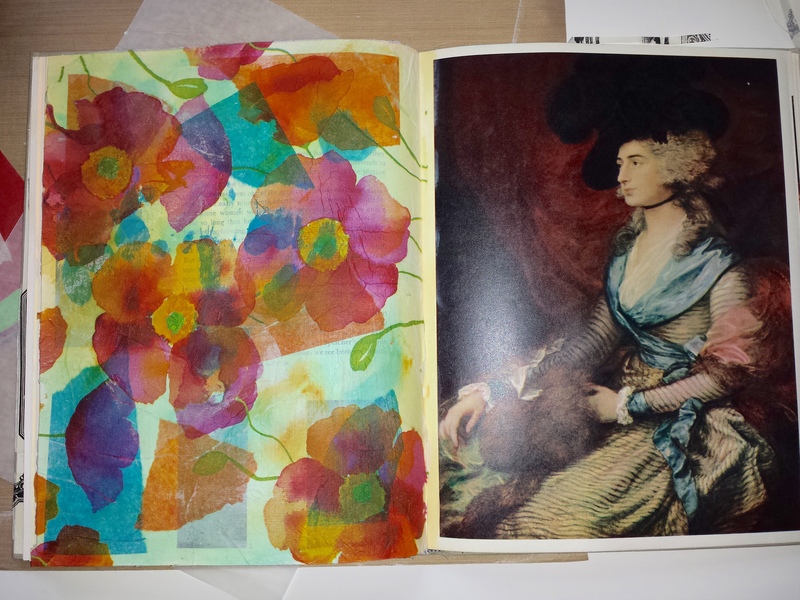 I must confess today’s blog post is actually a Facebook post from my new Facebook Group: Art Journaling 101 with StudioSeena. I’m touched by those who have told me how it’s inspired them and that inspired me to share it with you. 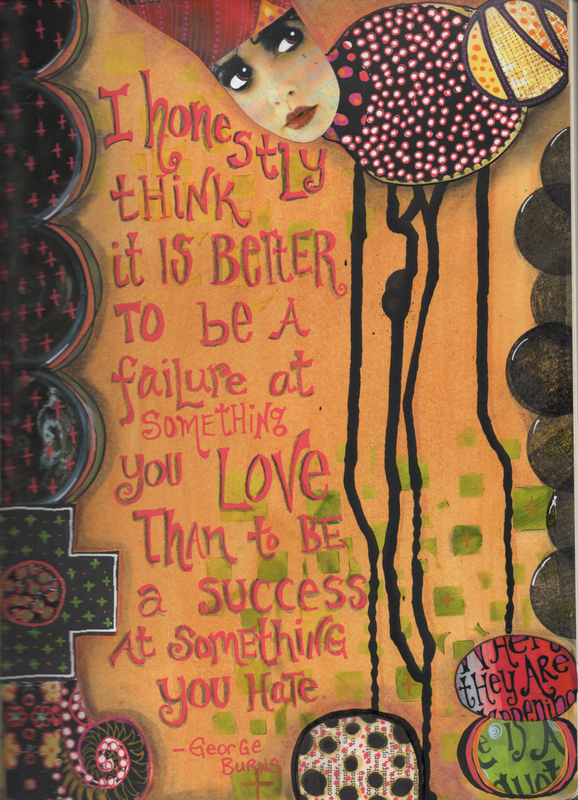 If you enjoyed it, I invite you join Art Journaling 101 with StudioSeena for more inspiration and encouragement. Tell your friends! You don’t have to be an artist to make art! I’m cringing as I look at the date of my last post – more than six weeks have passed in which I’ve broken the cardinal rule of blogging – don’t ignore your blog! 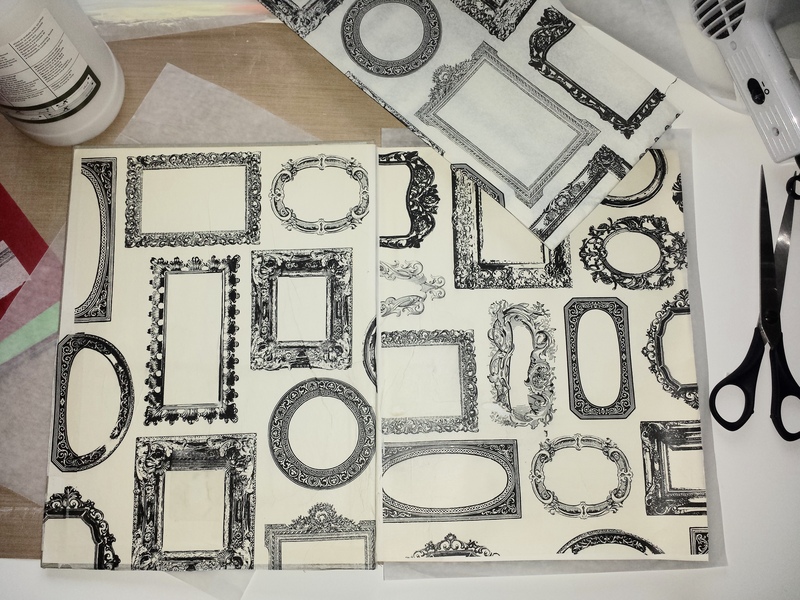 Even printed collage sheets… nothing worked to get me out of my slump. If I got anything out of this winter it’s the lesson that creativity doesn’t submit to force. Since the light in my workspace was dim at best I decided to flip my office and my studio. Big project! That resulted in lots of organizing, culling and weeding. The move did prompt an idea, but not one I was expecting. 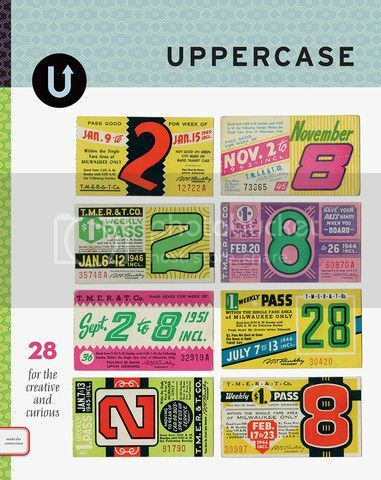 There were a number of resources I had, most of them vintage ephemera of one sort or another, that I either wasn’t going to get to, were duplicates of things I’d already used or things that no longer fueled my creative spirit. BUT, it occured to me that others might be able to find these things useful and so my little Etsy idea took on a life of its own. As I curate the chaos of my art studio and personal stash of creative supplies I will continue to add items. Please click on over and have a look. And let me know what you think! 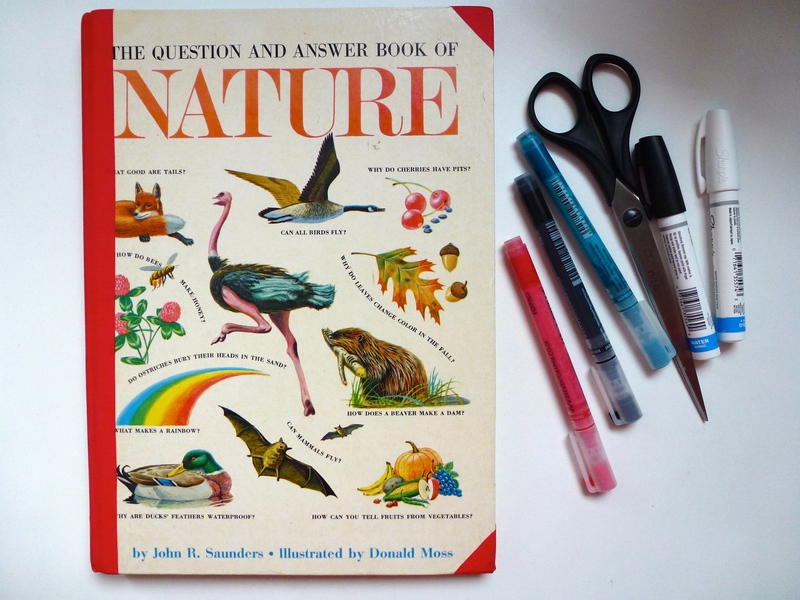 Since the ephemera is all resources I originally bought, reclaimed or thrifted to use in my own mixed media art, I’m only listing items that I believe would work in mixed media art. 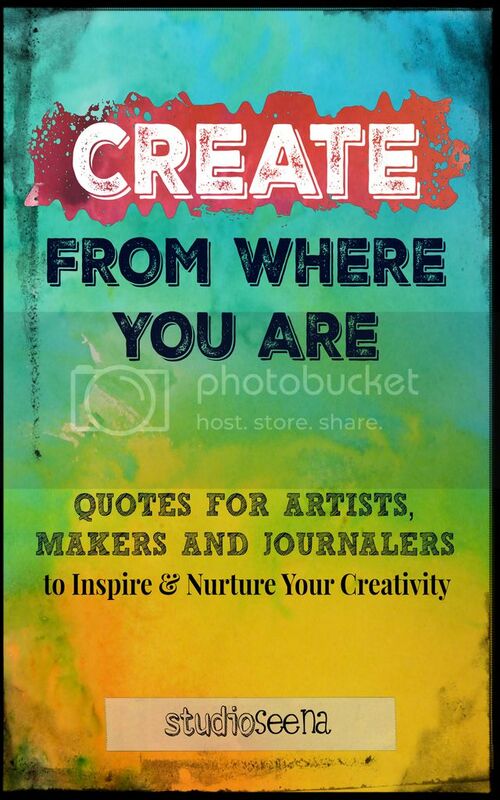 I hope it inspires and generates creativity in others. I’m happy to say I’m starting to fill them and look forward to sharing my pages with you. Leave me a comment and let me know how you’re doing. And what you think of studioseena at Etsy. 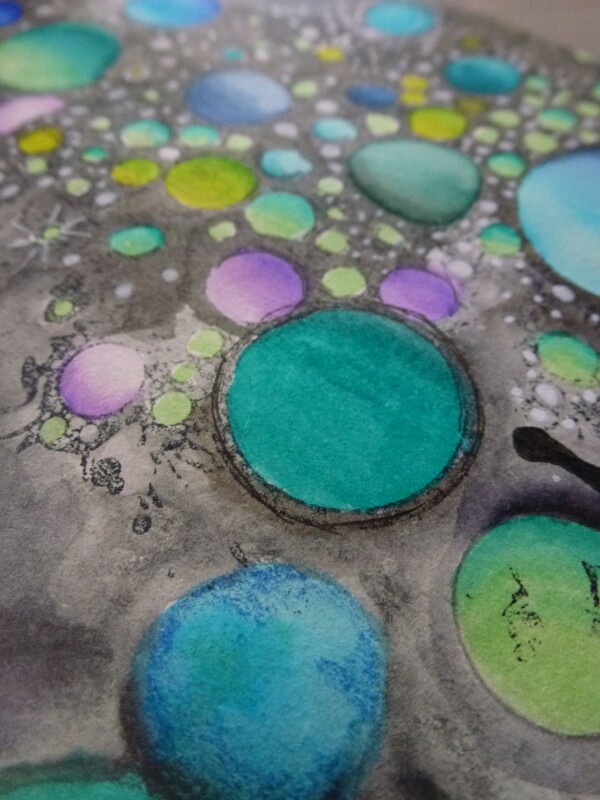 The lovely frandalicious56 commented in my last blog post that one of her obstacles was shading white circles. 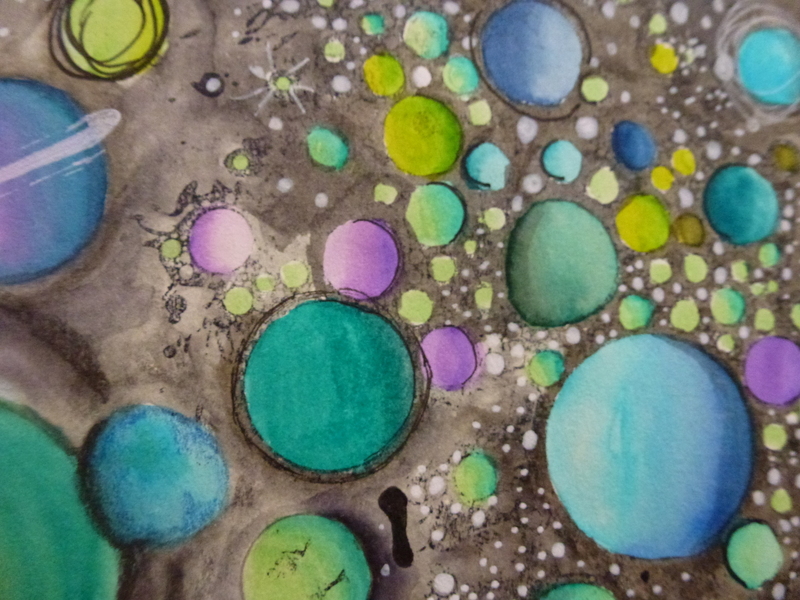 Well, these circles aren’t white, but I find them just as challenging! I had already been playing with my Zig Clean Brush markers and shading in my art journal and promised frandalicious56 I’d post it. 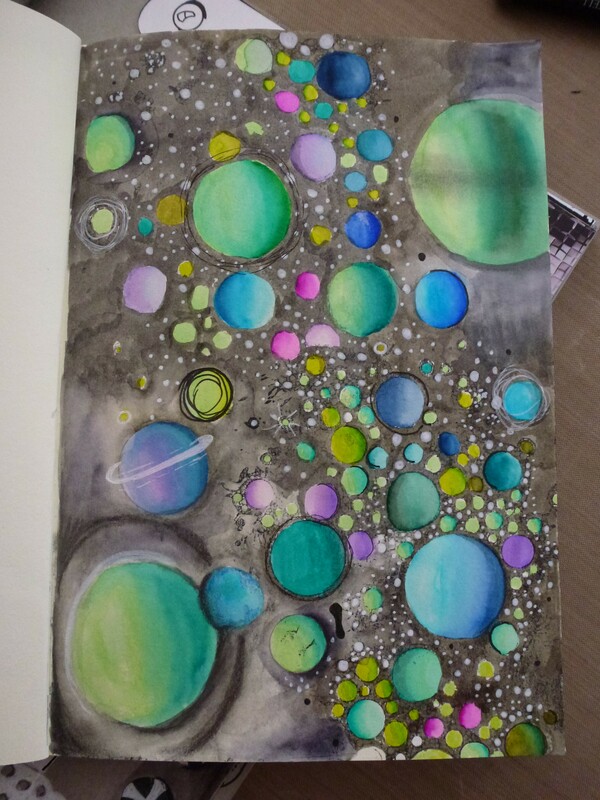 When I’d finished the shading I thought it looked somewhat like a galaxy of planets, so I colored grey in around the orbs and added white “stars.” I achieved the shading by using either a light and dark color in the same hue or one color blended until it faded out. I had a great rest over the holidays and came home feeling rejuvenated. 2015 is going to be a great year I think. It was an embarrassment of art riches for me over the holidays, between gifts and boxing day sales. 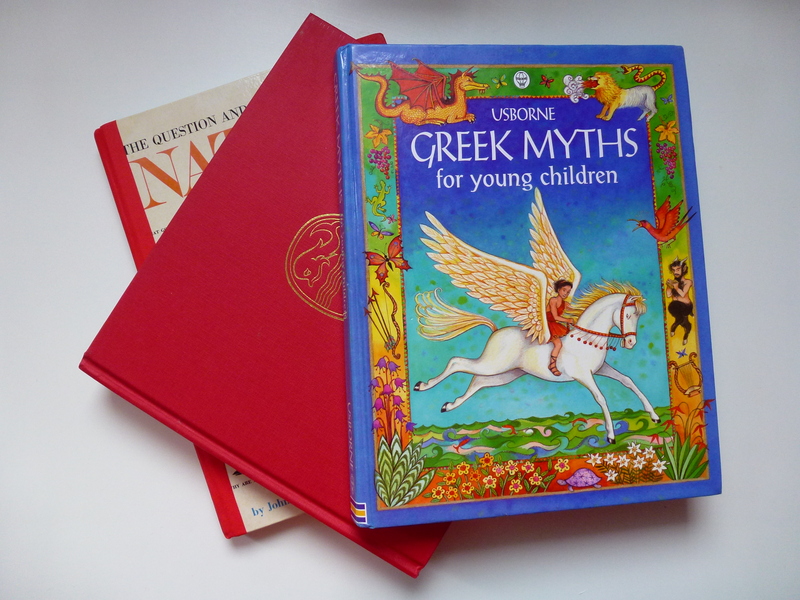 I’ll be sharing that with you, as well as some AMAZING books I’ve found, both for inspiration and collage.